Running a business is no joke. I think a lot of persons look at all these successful businesses opening up and think yeah that's easy, hate to break it to you it's not. This is not to discourage anyone considering starting their own business. Everyone knows I am all about creating your own wealth but if you really want to succeed at it, you have to put in the work and "this work" is not just about being the best in the type of products or services you're selling. The work also includes preparing ourselves mentally. 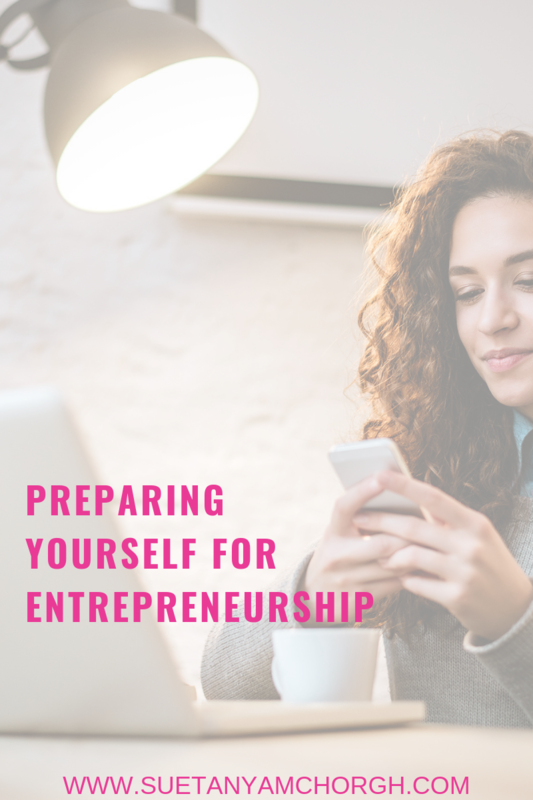 Here are three things I recommend that you do to prepare yourself for entrepreneurship. Know How To Persuade People / Influence. So you have this great product or this awesome service idea and you decided to turn it in a business. Great. How will you get the message across to your target audience? Marketing. You have to know how to persuade or influence people to buy your product or service. It sounds easy but a lot of people struggle with this part. Ask them to talk about their business and they choke. People need to believe in the product as much as you do. If you're struggling in this area, I suggest you start small by going to a few business mixers and networking event with business cards to talk about your business. If your problem is not knowing what to say, try preparing an elevator pitch and practise it until you have it memorized. Stop Worrying About People's Opinion. People will think whatever they want. Some will be for you and some will be against you. That's just the way life is. If you find yourself too focused on what a person has to say about your business then you're in trouble. Do you know what's really important? Knowing who you are and what your purpose is. Every day you should be working on small tasks to get you to your ultimate goal. Whenever you feel yourself worrying about what others think, just remind yourself of your goals and what you're doing to achieve those goals. Know Your Why and Purpose. Knowing your purpose and why is key because it's what will keep you focused and keep you motivated to get to where you want to go. Knowing your why and purpose helps you to stay passionate about your business which if you keep at it will keep your business going for a long time. Persistence. You are going to need will power and persistence to keep going when the times get hard because they will. What if Oprah wasn't persistent? What if Steve Jobs stopped believing in his dream? Instagram's Highlight is probably one of my favourite features on Instagram. I've seen brands online use this feature to market their products and services. Add story to the Instagram Highlight, extends the life of the story which is usually from the usual 24-hour timespan to as long as you would like it to be shown on your profile. In this blog post, I highlight 4 amazing ways to use Instagram Highlights to promote your products and services. I know how hard it is to come up with clever Instagram Bios, especially for business. Your Instagram bio is a great way to leave a good first impression and should be impactful. Your Instagram bio can include a brief self or brand description, contact info, emojis and hashtags. Netflix and Chill...I'm sure you have heard that term being used a few times and if you haven't let me get you up to speed. See Netflix is this really cool app that allows you to stream your favourite series, movies and documentaries. For some persons, blog writing comes naturally but for some, a little guidance is needed. Here is a simple checklist you can use when creating your posts for your blog. I absolutely appreciate it when my hard work gets noticed by others. Today I found out that I was featured and nominated in 𝗧𝗵𝗲 𝗗𝗶𝗴𝗶𝘁𝗮𝗹 𝗝𝗮𝗺𝗮𝗶𝗰𝗮 𝗣𝗲𝗼𝗽𝗹𝗲 𝘁𝗼 𝗪𝗮𝘁𝗰𝗵 𝟮𝟬𝟭𝟵 : 𝗘-𝗕𝘂𝘀𝗶𝗻𝗲𝘀𝘀 𝗡𝗼𝗺𝗶𝗻𝗲𝗲𝘀 category. Thank you Kadia for featuring my business. Do you find yourself overthinking and evaluating a decision so much so you don't end up making it? Maybe you have a business idea, you know it's a great idea, you want to start your business but you keep procrastinating or simply not taking action? Ever been so overwhelmed with options that you can make a decision? Keep saying one day you'll do this or i'll be that but that day never comes? Yes, Instagram has a new feature and it's called name tags. So what is it? How do you use Instagram's name tag feature? If these are questions you have right now, this post seems to answer them. Let's start off with what is it. A name tag is like a special code that people can scan, in person ofcourse, to instantly go to your Instagram profile. Have you ever tried to post an image on social media for your personal brand or business only to find that it wouldn't fit in the image box provided? Social media keep changes and trying to keep up with the constant changes in social media can be tedious so I decided to make it really easy for you and give you this social media image cheat sheet.